Moist and chewy maple blondie base mixed with caramelized pears. Frosted Maple Pear Blondies topped with a cinnamon cream cheese buttercream frosting. Sometimes life, especially during the holiday season, can get busy and overwhelming. Or maybe your day didn’t go too well. I’ve certainly had both of those feeling recently. Luckily there’s at least two things that can always make it better; a hug or some delicious homemade dessert. These Frosted Maple Pear Blondies can’t really give you a hug, but they’ll sure make you smile. 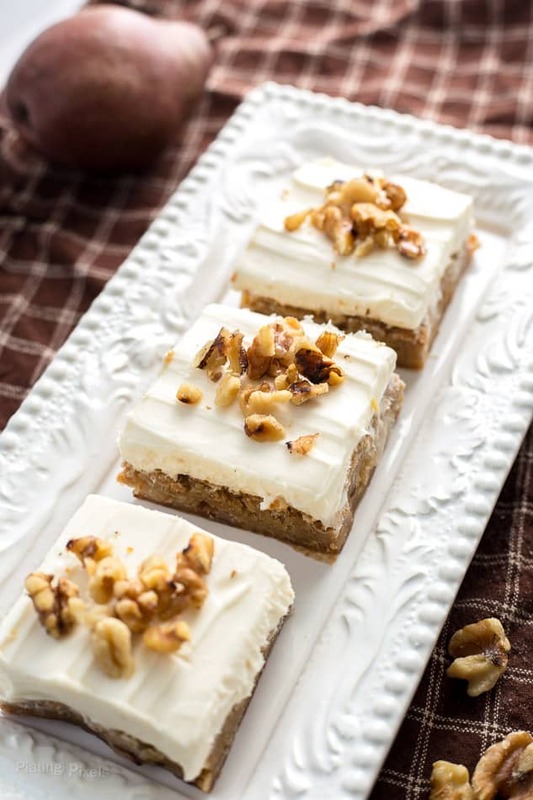 Full of holiday cheer and moist, chewy goodness, these simple blondie bars are sure to be a hit. What’s a blondie you ask? It’s basically a brownie without the chocolate or cocoa powder. Same chewy base, but with more of a buttery flavor. On that note, I like to brown the butter a little longer in a pan to give them more depth and bring out a subtle roasted flavor. 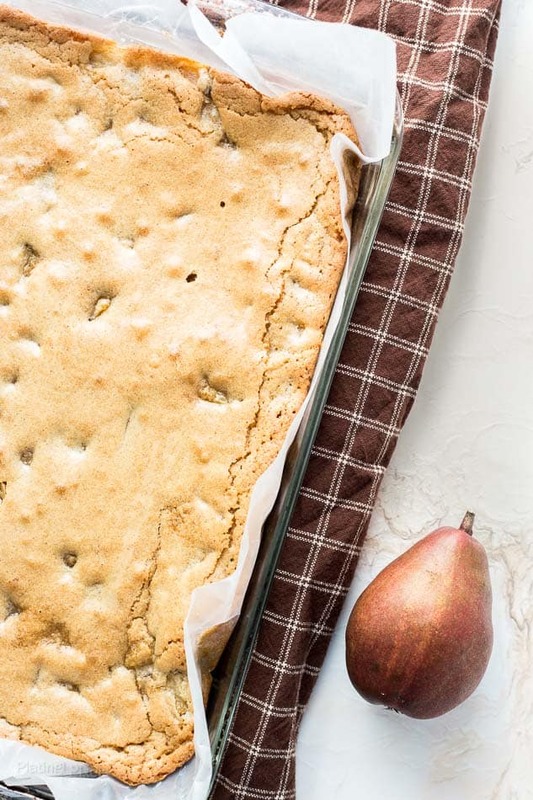 Frosted Maple Pear Blondies are simple and can be made by the whole family. Basically it’s a cookie base, but much softer. Maple syrup, caramelized pear pieces and cinnamon create a unique fall flavored dessert. It’s a fun hands-on dessert with a rewarding finish. To literally top it off a creamy cream cheese buttercream (yes that’s a mouthful) gives a silky, sweet and slightly tangy complement to the rich maple pear blondie base. Flavor profiles: Buttery, sugary and caramelized flavors with a sweet and tart frosting. Texture: Dense and chewy brownie base with a silky buttercream frosting. Moist and chewy maple blondie base mixed with caramelized pears. Topped with a cinnamon cream cheese buttercream frosting. Preheat oven to 350 F. In a large sauce pan melt 1-tablespoon of the butter over medium-heat. Add pears and cook until softened, about 10 minutes stirring occasionally. Remove pears from pan. In same pan, melt remaining 11-tablespoons butter over medium-high heat. Stirring often, cook 1-2 minutes more to lightly brown. Remove from heat and stir in maple syrup, sugar and brown sugar. Stir in egg and vanilla until combined. Stir in flour, baking powder, soda and salt to create. 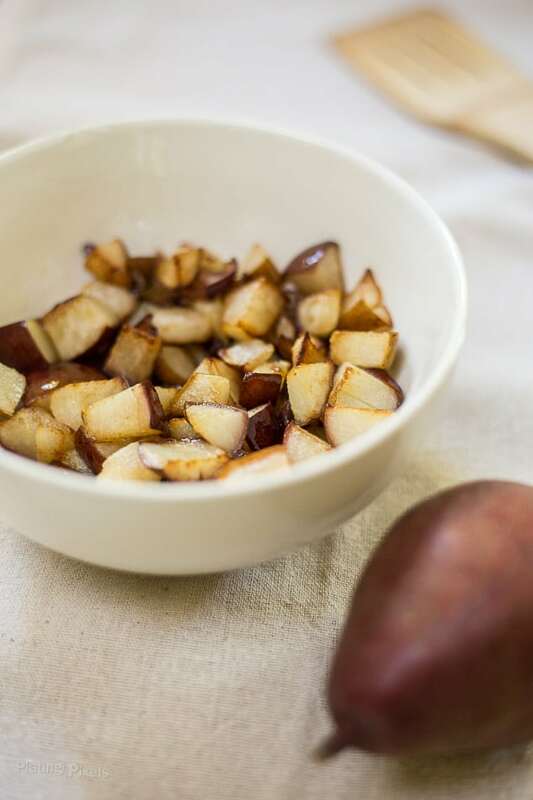 Fold in cooked pears. Pour batter into a foil or parchment lined 13x9 baking dish. Bake 25-30 minutes until lightly browned and edges are puffed. Cool on a wire rack then remove from dish. Beat together softened cream cheese and butter on medium-high speed until well combined. Carefully beat in powdered sugar, cinnamon and maple syrup on low until combined. Evenly spread over uncut blondie base. If desired chill for 30 minutes to firm frosting. 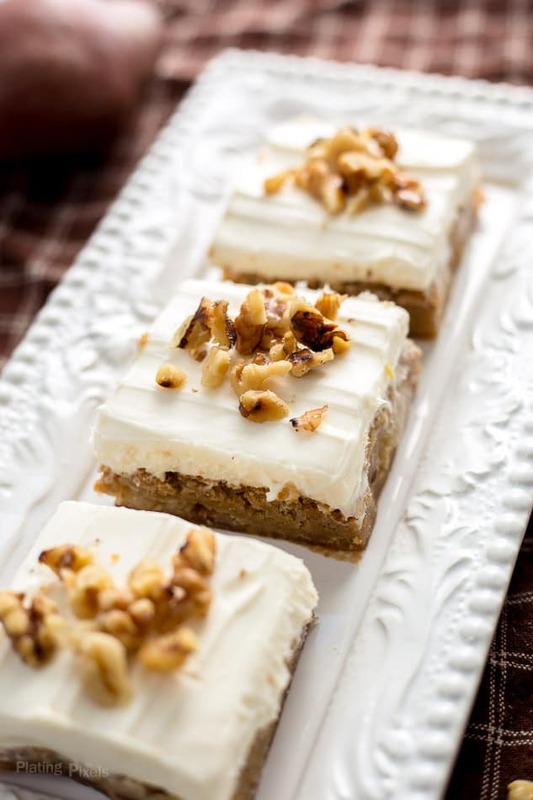 Cut into small bars, top with walnuts and store extras in fridge. So creative!! Love the addition of pears to these blondies! genius! 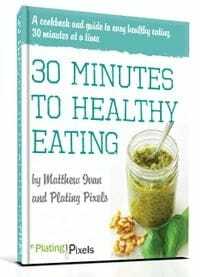 Nice recipe and beautiful pictures. Maple is a great addition! Maple and pear???? You may have just convinced me to choose a blondie over a brownie.. and I’m a chocoholic!